There is never a bad time to invest in your mind. Don’t neglect this part of yourself. There is no harm in learning valuable lessons gained through someone’s 20 to 30 years of experience. Eleanor Roosevelt once said: "You don't have enough time to make all the mistakes on your own so you got to learn from others". (Disclaimer: this post has affiliate links). This book lays out the 3 essential things every person must have before taking them into your team. Learning what the 3 essential things are will help you know how to make it a win-win for everybody. Reading this book will help you realize why some team members did not work out while others worked out fine. If you’re going to build a team, then this book is right for you. What does it look like to live a curious life? This book shows the benefits of living inquisitively and how to do it without massive judgment. If you want to build a big life this 2019, connect with incredible people, and find opportunities you’ve been missing out, you need to read this one. If you struggle to get things done then this is the book for you. You realize all the different self-sabotaging ways that prevent you from completing tasks. What some of the roadblocks were that kept you from actually getting things done. You’ll realize these roadblocks are not really a dead end until you allow it. It’s best to read this before you write your plans for the year. This book is about a team who went from 0 to a million dollars in 3 years. You will learn how to build a team the right way. There are really great insights provided on building a team and how to level up. This is the book you wish you had years ago. We all experienced difficulties in recovering from failures. After reading this book, it would be easier to pick yourself up. There will always be struggles along the way so learning to bounce back is an important life skill to learn. A business has a natural cycle. At the beginning there’s a struggle, then you get to the fun zone, then you go through white water. The book talks a lot on how you actually can get to predictable success and how to keep yourself from falling the other side and die. If you’re running a business this will help you know what stage you are currently in. Readers get additional tools and tactics to survive each stage of their business journey. 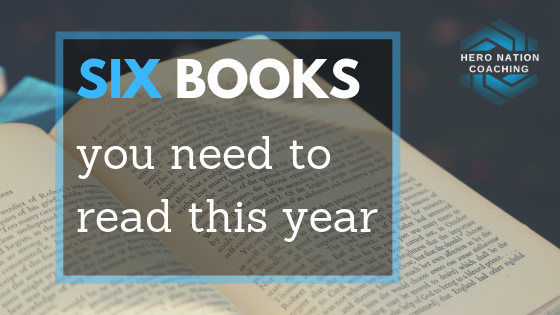 In all these books you get the lessons that took these authors years to live and learn from. They also put all the lessons learned from their failures because we don’t have enough time to live and make all the mistakes they made. Life is too short to not live it the best that you can. It’s your time to shine. Live heroic lives. Are you looking for strategies and tools to help you build successful business and relationships? Hero Nation Coaching gives you clarity, powerful tactics, systems, massive momentum, higher and more predictable income and balance it with a BIG EPIC LIFE. Our clients have done it. You can too! Schedule your FREE Strategy session NOW to see which coaching program will work for you!